Hey there ! I’m still alive ! 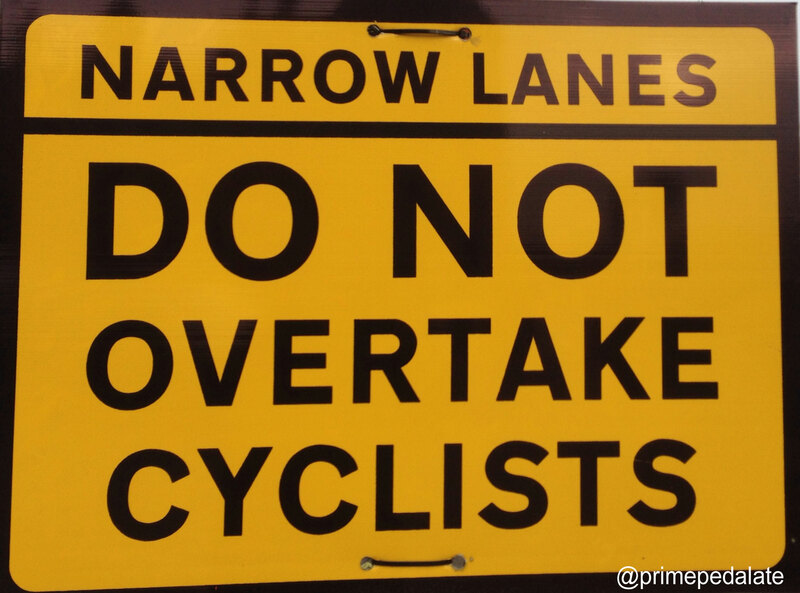 And back with a post that has nothing to do with the bicycle world, because since my husband has ” suggested ” me to leave my roadbike in my garage until spring for the benefit of the mountain bike , which I do not like ( euphemism! ), I focused on something else. Especially on walking , which I had never practiced before. During less than a month I walked about 260 kilometers, and I must say I love it ! A part from this, at the end of November I went to London with my children for a two-day-only-break and this is what I’m going to talk to you about, as a few friends asked me suggestions about this trip with a toddler. And here I am . It was the fourth time I went to London with my elder daughter and this time I even brought the small one , and with no stroller ! I am crazy , maybe , but I love the thrill ! 😉 Except for the small detail that the first my mom, who was with us , walking in Hyde park fell and fractured her arm and that , like all mothers , with a stoic strength , did never complain about this , the trip went very well . So here’s my mini practical guide for anyone who is brave enough to go to London for a weekend with their very young children. My advice is before you go to get a Moleskine diary dedicated to London. It ‘s perfect because the first pages have the Tube and the some areas detailed maps then some blank pages and at the end of the agenda, some pages dedicated to restaurants, hotels and so on. I always travel with a huge leather wallet by Pineider , which is more like a document case, where there is enough room for everything you may need: slots for credit cards (and loyalty cards, of course! 🙂 ), folded A4 sheet , with all possible reservations, information, boarding passes , British banknotes , which are larger than Euros, and a zipped pocket for coins. .
Before booking an hotel , focus on the where you will want to move around with your toddlers. The first few years I would always book a lovely hotel in South Kensington , as when I went there I often had business appointments in the nearby and because that is absolutely my favourite area of London and having the chance to go jogging early in the morning in the streets of Chelsea and South Kensington up to Hyde Park was like heaven to me. This time , taking with me both my children I chose a hotel in Covent Garden, where in the evening, you can easily walk to restaurants, cinemas, and theaters, and have a pleasant stroll to Piccadilly Circus or to Leicester Square . Personally, I gave up flying Ryanair because the game is not worth the candle. After flying , when I was working in Rome , Ryanair twice a week for about 4 years , I think I have exhausted all the patience needed to be treated like cattle , when, in fact , you are paying for a service ! So now when I go to London I always and only fly British Airways , which has , however , super deals ( just keep an eye on the website and book with a little in advance. I paid about € 90 round trip ) My suggestion is , if you’re traveling for a few days , in groups, and with children , and you do not need to have a suitcase each, to take some tickets only hand luggage fare and others with the suitcase one , so that you can pay even less . The website also gives you the option to choose seats at the time of booking or while you are checking in online for a fee, but it is not compulsory. If you book your flight and your hotel at the same time , always on the BA website , you can find good offers on the hotel fares. If you have a BA frequent flyer card BA you can accumulate points to get free tickets and / or various discounts . I am a loyalty card – addicted,if this wasn’t clear yet. Then , in reality, I do not know what I can use it , but I MUST have the card ! A few years ago I found a great cab company . They only service to / from the airports. It’s called BA Transfer , and in my experience , they work very well. Punctual, careful, kind, with clean and tidy vans ( we’ve always been in 5 /8 people ). The cost (round trip for 6 people from Gatwick hotel to central London ) is about 140 pounds , in total. If you have the card ( as, of course, I have the loyalty card) … there is a 5 % discount. If you think about the cost of the train traveling from Stansted airport (where Ryanair airplanes land), added to the metro and bus tickets ,summed up to travelling with your children and your and their luggage… it’s worth it . so you are aware , in real time, of what London has to offer for children in the chosen period. If you can, do not go there during the Autumn break: a nightmare ! the end of November and towards Christmas time in general, however, is wonderful. 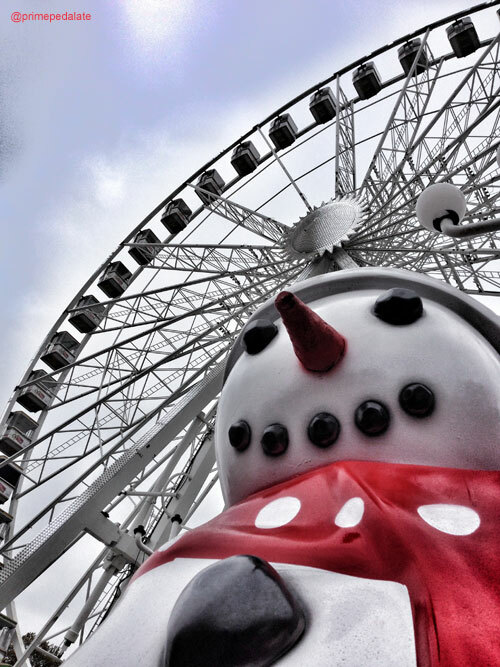 From 10 am , to 10 pm , in Hyde park , you will have the opportunity to visit a great amusement park. At the entrance you’ll be given a map of the park (also available in all the booths where they sell tickets to the attractions ) and then for hours and hours and hours you can enjoy yourself on a giant wheel , with mirror games , ice skating … taking a picture with Santa Claus, who will also give a small gift to your children, going to the circus (there are two ) , rollercoaster ride , having a stroll around the picturesque Christmas markets… truly a wonderland ! Some attractions can be booked through the site, which is a great way to skip the queue.When you leave the winter wonderland, pass thought Hyde park. Not far from Hyde Park, you cannot miss the chance to visit the Natural History Museum and just opposite to this, the Science Museum. The first ( http://www.nhm.ac.uk/ ) in this period and until January the 5th housesoutside, a 1,000 square meters , wonderful ice rink . Opening hours: from 10.00 to6.00pm , and the last entrance is at 5.15 pm. The museum at this time is celebrating the 150th anniversary of the London Underground with a series of activities for children and their families , ranging from the history itself, the construction of transport thanks to “make and take “offered by the museum. The entrance is free for children up to 16 years and costs 15 pounds for adults. The ticket is valid for a full year . At the Build-a -bear shop works like this … you get in and on your left there are a lot of anymals, or rather , the body of them, not yet stuffed. So the first thing the child willhave to do is to choose the kind of teddy “bear”… a bear, a bunny, a cat, a dog, a baby plush and so on… (and this already takes at least 5 minutes, if your child isn’t too picky). The next step is dedicated to the music, if your child wishes to add a jiingle to be placed inside the animal. And your child will certainly do. There is a sort of a table which displays 12 buttons with 12 different music , which actually seemed to me 12 thousand different kinds of jingles , and once the preferred choice is done what you need to do is to take out from the drawer with the corresponding number, the plastic mechanism that reproduces the music . BUT BEWARE : ( GREAT FAMILY DRAMA ! ) It happened to us that the music from the drawer didn’t match the proper number…so in order not to stand once again in the queue (yes , you have to know that there is ALWAYS a queue) , double check your jingle , once you have taken it from the drawer. . When , exhausted, you finally reach the casher , you will be asked if you wish to have a birth certificate for your teddy bear. I, in the meantime you have run out of patience, I strongly recommend you to answer: no, thanks! Unfortunately my eldest daughter was just next to me and she is bilingual, so she perfectly understood… and we have not skipped ​​ the birth certificate of the Drag Queen bear… This was first time we were there. The next time I made my daughter promise promised that we would go just as long as we didn’t have to queue to buy the certificate and didn’t have to buy the teddy bear passport either, as she had noticed the first time, then the airport it would not be asked for documents ! When you finally manage to get out of the Build-a -bear shop and you step out of the door, TURN LEFT! If you make the horrible mistake of turning right , you would be in front of the DISNEY STORE windows. Don’t say I didn’t warn you!!! 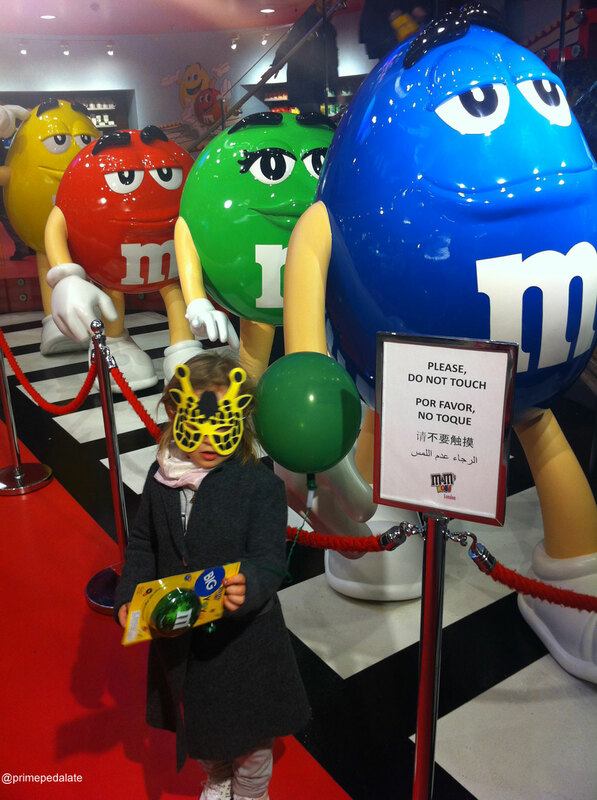 Another place that is a real landmark for us, when in London , is the M & M ‘S World in Leicester Square . Even here 4 floors of useful crap but it is impossible to leave the shop without purchasing something. For what concerns us: an immensity of chocolate. The M & M’s are locked up in mega vertical cylinder , divided by color and type (chocolate and peanut , chocolate and puffed rice and simple chocolate) . Sales people are, however, very kind and if your kids fill too many bags, they kindly help you to empty them., ( and I know that it will happen! ) 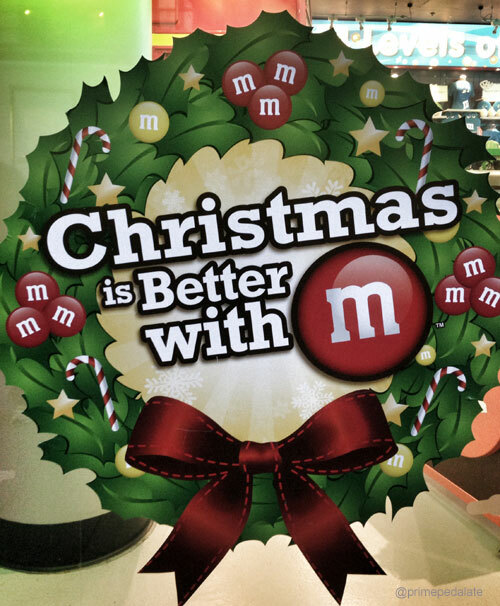 Downstairs there is also the laboratory of M & M’s ….. I do not recommend . It is an endless queue for nothing. 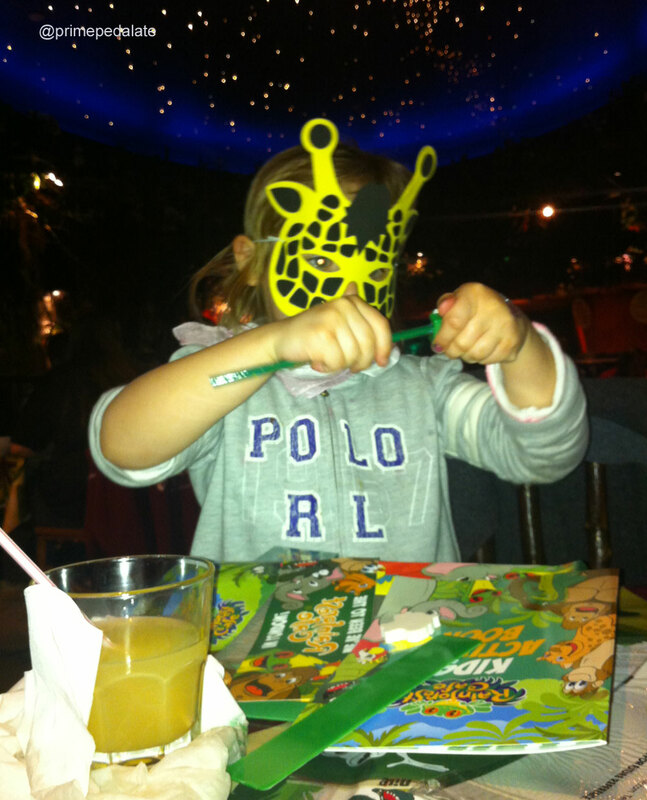 Now the Rainforest cafe is one of my nightmares Londoners , I still dream of the night and the sounds of thunder trumpeting elephant in tropical forest, but after all the food is good (I recommend the appetizer ” Lava Nachos”, the cheesburgher and the pizzza for the kids. Not far from the rainforest cafe is the Ripley’s believe it or not . It ‘ very dear to me and not exactly worth the effort, and in fact we did not go , but definitely would love to bambnini . Online you will save money on the purchase of tickets. http://www.ripleyslondon.com . If you get there, look up now and see how they decorated Piccadilly Circus. Cupid is enclosed in a glass boule à neige . I found it fantastic ! If you have a child under 4 years old is very difficult to find shows where they too can be accepted. We this time we found the show The Showman , at the Peacock Theatre and it was very cute. While you ‘re in the area , a walk in St James’ Park with your kids you can not do it. It ‘s great . And while we ‘re walking up to Trafalgar Square. 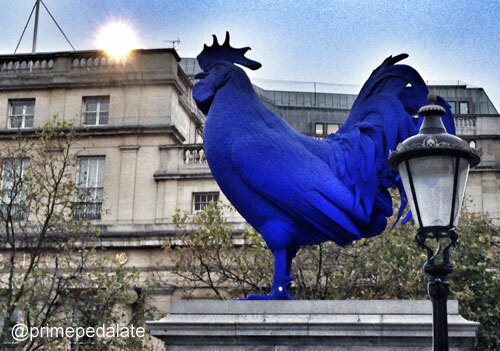 If they do not want to hear the story of the battle or of Nelson, definitely appreciate the Blue rooster! What have I forgotten ? 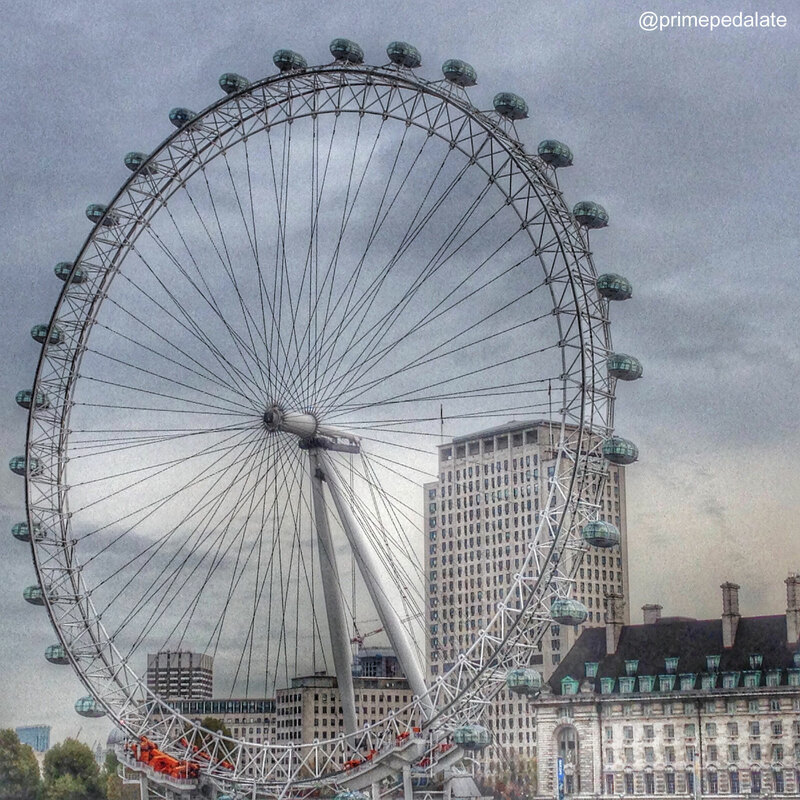 Well certainly the London Eye, on which I did not go because my daughter fears hight , but which is amazing, of course! 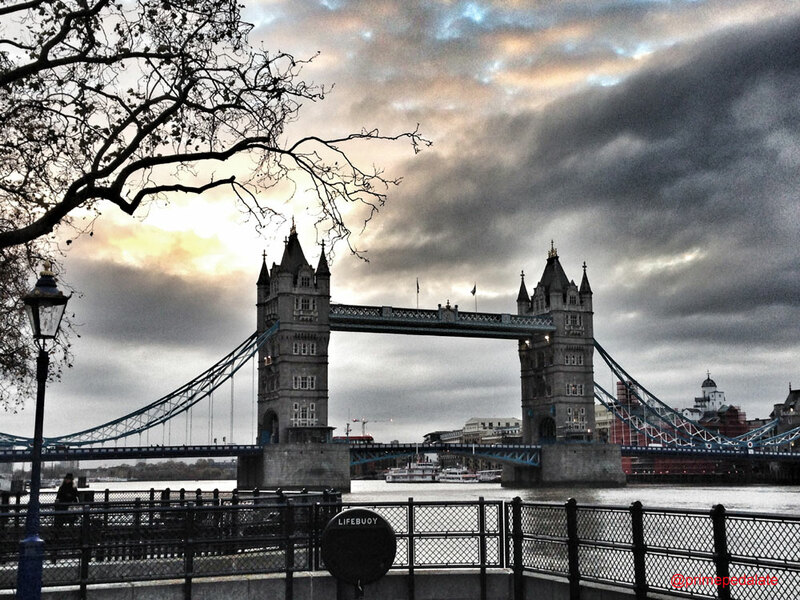 or the crown jewels and the Tower of London, but when years ago I went with my daughter the only thing she loved was the wonderful view on the Tower Bridge. and…Madame Tussaud’s, the London Zoo , the Kew Gardens and surely many other attractions and places to be seen. But if you only have two days….in any case leave something back is a great opportunity to have an excuse for another visit to London! This entry was posted in A.O.B. and tagged British Airways, Hyde Park, London, london with kids, london with toddlers, Ryanair, South Kensington, travelling by Ari rides her bike. Bookmark the permalink. You had a busy day. Thank you for having an English translation. Hi! Thank-for so much for your comment! Every time I translate what I write from Italian into English, I ask myself if my translation makes any sense! 😉 I hope it does!! !